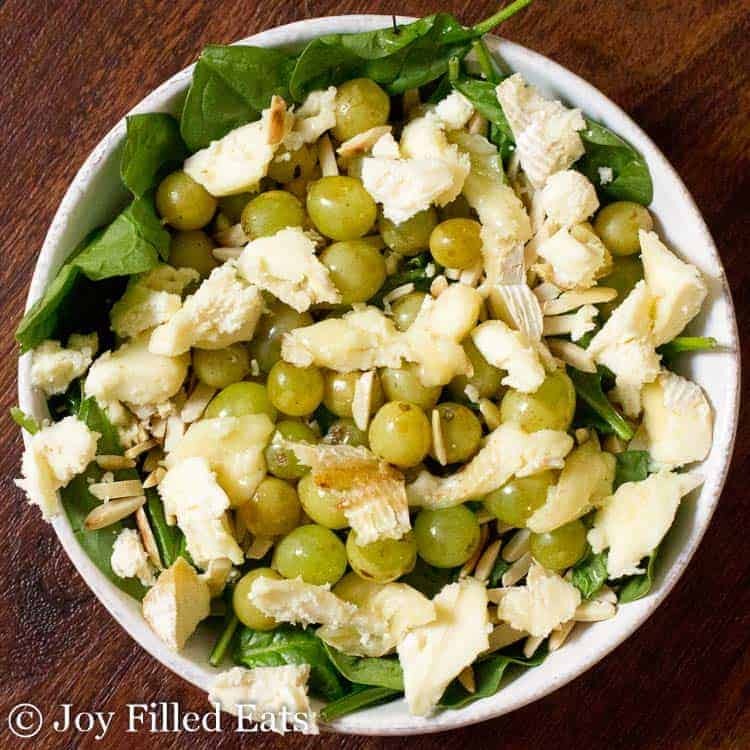 My Spinach Salad with Grilled Grapes and Brie Cheese combines the ultimate contrast of flavors. 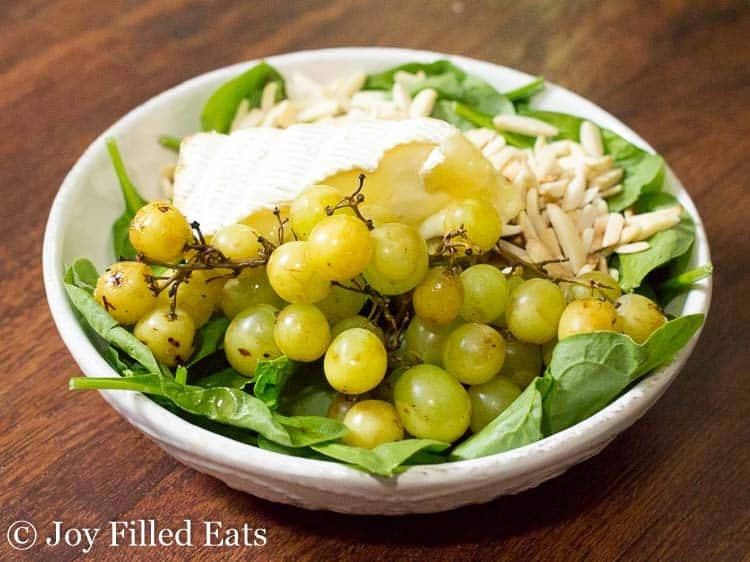 With the sweetness of grapes paired with salty brie and crunchy toasted almonds, you will be in salad heaven. 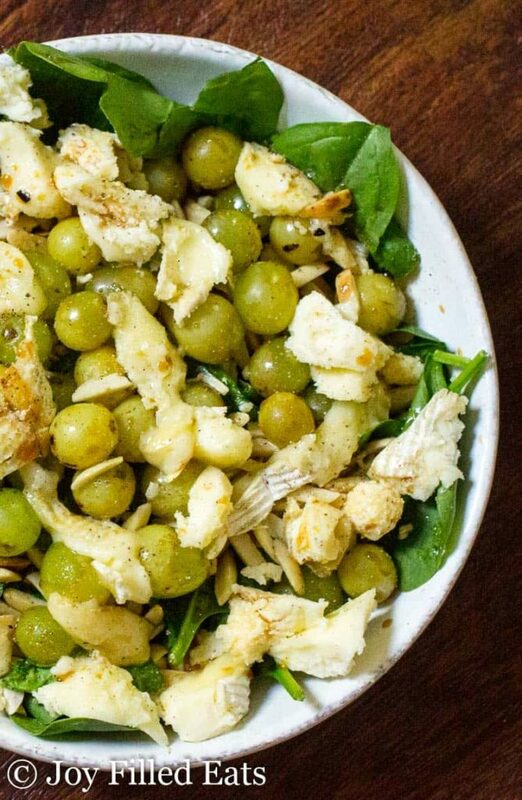 This Spinach Salad with Grilled Grapes and Brie Cheese was the best salad I have ever eaten. Ever. And over the last 36 years, I’m sure I’ve had thousands of salads. Thousands in my own home and at least a few hundred in restaurants. This was still the best one. 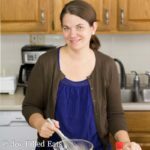 I’ve gone back and forth about sharing this on my blog because it will be a crossover for my Trim Healthy Mama readers and grapes aren’t low carb or keto either. But this is all natural, gluten-free, added sugar-free, only has a handful of ingredients, and is absolutely delicious. So here it is. If you are low carb, keto, or want to keep this to a Trim Healthy Mama S side dish instead of a crossover simply don’t eat the grapes. 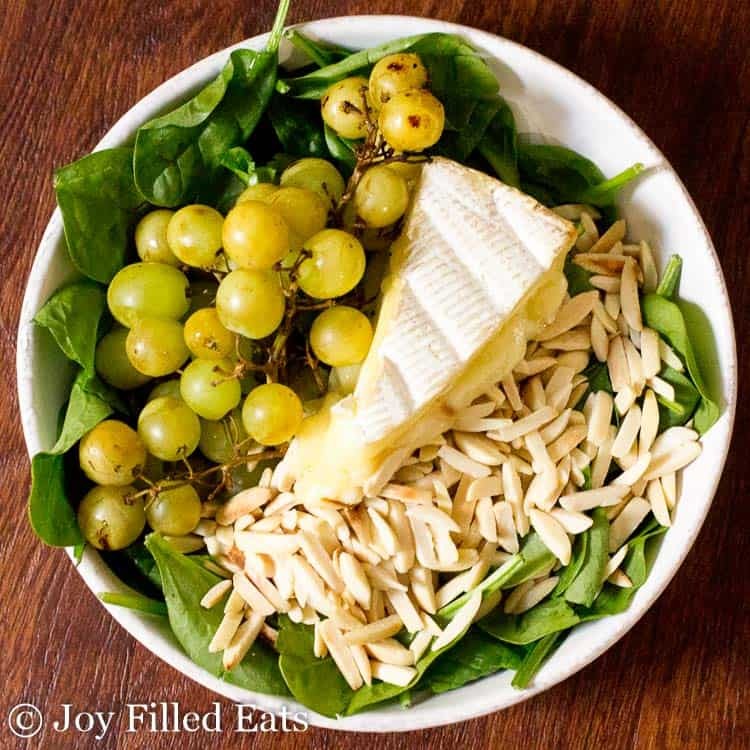 This is a great spinach salad to impress dinner guests so they can take it all while you just enjoy the spinach, almonds, and brie. If you want this spinach salad to be an E for Trim Healthy Mama just leave off the brie cheese and almonds and top with a lean protein. 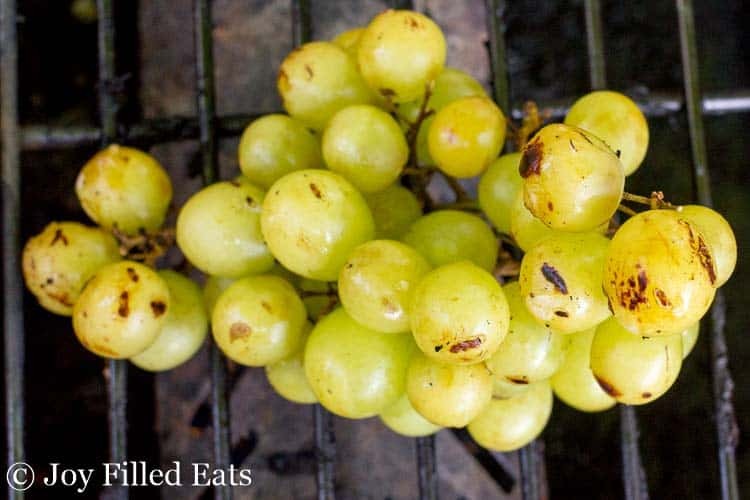 Grilling grapes add an amazing depth to their flavor. The trick is to grill them on medium-high heat so they get warm and the skin chars a bit but not to let them pop open. You want them to pop open in your mouth. Warming up the brie cheese, wrapped in foil, on the grill is my other trick. You don’t want it totally gooey or it’s hard to cut into pieces to top the salad. I actually used a frozen wedge of brie (did you know you can freeze brie? you can! ), wrapped it in foil, and popped it on the grill for just a few minutes. It thawed enough to cut into small pieces with kitchen shears. And the edges got a little of that nice charred grill taste. To make this a complete entree instead of a side dish just top it with some grilled chicken. Put the baby spinach in a large bowl. Set aside. Turn the grill on medium-high. 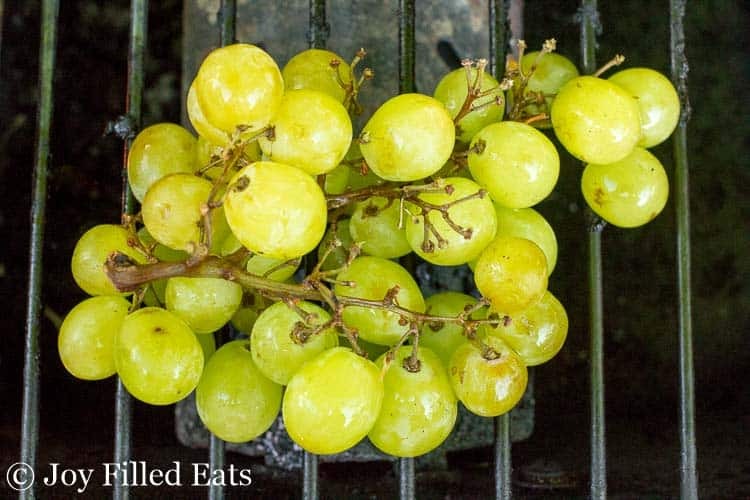 Add the grapes and turn them carefully, every minute or two, until they are warm and the skin is slightly charred. Meanwhile, wrap the brie cheese in aluminum foil. Add to the grill and grill until slightly warmed. Remove the grilled grapes from the stem and put them on top of the spinach. Use kitchen scissors to cut the brie into small pieces on top of the salad. Sprinkle the toasted almonds on top. Drizzle the oil and vinegar over the salad. Season with a little salad and pepper. Enjoy! You can also toast the almonds on the grill if desired. Just wrap them in foil and watch them carefully so they don't burn.